I am a Green Bay, WI native who loves to getaway south to the sunshine and magic of Walt Disney World! My husband Ryan and daughter Maddie are my favorite travel buddies. We also enjoy gardening, cooking, being active outside and cheering on the Packers! I am a Disney Destinations specialist who also books Universal, SeaWorld, and other destinations by request. Walt Disney World – I am a former Walt Disney World cast member with more than 50 visits. 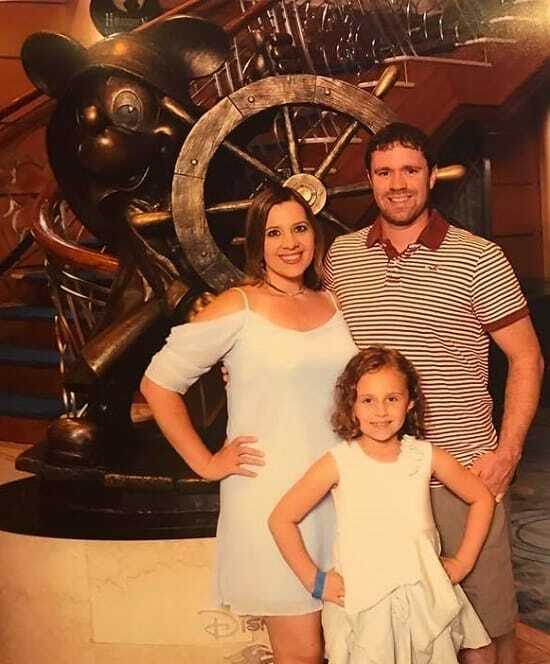 Disney Cruise Line – I have sailed Disney Cruise Line multiple times. I enjoy all travel and have visited several European and Asian countries, as well as travel throughout the US, including Hawaii. READY TO BOOK WITH ME? FILL OUT THE CORRECT BOOKING FORM BELOW! If you have vacationed with Marissa being your travel advisor, please leave a testimony of your experience below! Marissa is a fantastic vacation planner! She has taken care of all of our plans down to the smallest detail and created a fun Disney time that I am looking forward to! Thanks Marissa!!! Nobody knows Disney like Marissa!!! She doesn’t just book the package – she prepares an entire plan including fastpasses, dinner reservations, touring plans, airport transportation – everything! Where do I begin!!! Marissa is AMAZING! I probably swamped her with a million questions literally lol, but she was always prompt and never seemed to be annoyed by all of my questions. She shows pride in what she does 😀 I will for sure be planning another trip with her in the future!!! Thanks again for all of your help your awesome. Thanks so much to Marissa for all of the help in planning our Universal Vacation! She was so helpful in providing multiple different quotes and finding us just the right vacation package. She was able to find us a great price and kept in communication. She was quick to answer questions and was always helpful! Be sure to consider booking a vacation with Marissa if you are headed to Universal Studios or Disney!! Marissa made our first trip to Disney easy and enjoyable! She planned it all and we loved everything. Highly recommend Pirates & Pixie Dust! After a fabulous week away, I want to give a HUGE shout out and high recommendations for Marissa Selner of Pirate and Pixie Dust Destinations! (Marissa lives in Howard, WI; however, is able to assist people wherever they are located.) Honestly, I cannot say enough about Marissa and all her amazing help in planning our Disney vacation!!! Last July I hesitantly contacted Marissa with the possibility of going to Disney (Hesitantly, because we weren’t sure if we we were really going to go…and because I wasn’t sure if Marissa had a fee for her planning services.) Marissa promptly answered all my questions and more…and I very quickly realized that booking with Marissa was less costly than the offers I was finding through many searches online. (And yes, when booking with Marissa, her services are free!!!) This was our third family vacation to Disney–the first we planned on our own, and the second we went through AAA. Marissa made this trip crazy easy for us, as she provided so much help in the decision making for our group of 9–doing all the legwork and providing quotes of various possibilities, Disney tips, creating an itinerary that was easy to alter, reservations, and more! Even her awesome recommendation of flip flops carried me through five parks with complete ease!!!!! Marissa is beyond helpful, efficient, and professional…and she planned our week through one phone call and a few Facebook messages and emails (well several, because I was full of questions!) Furthermore…we were originally scheduled to go on our vacation in December, but had an emergency situation in which we needed to cancel just days before…Marissa handled EVERYTHING for us with ease and completely rescheduled our entire vacation with understanding and professionalism. She took care of ABSOLUTELY EVERYTHING (except packing our bags, lol! ), and as I mentioned earlier, the rates were less costly than I found online! I know this is long…and no, Marissa did not ask me to write this post; however, Marissa deserves the accolades! Therefore, if you are looking to go to Disney or Universal, or go on a Disney cruise or to a Beaches Resort, Marissa with Pirate and Pixie Dust Destinations is your girl! Thank you for planning a wonderful vacation for us, Marissa!!!! !